Canelo-GGG 2: Does Bad Blood Mean Spilled Blood? The first fight between Gennady Golovkin and Canelo Alvarez checked nearly every box associated with the term “superfight”: the two best in their division competing for supremacy, both of them in or near their primes, arguably the top pound-for-pound fighter in boxing and an opponent assuredly in the top 10, arguably the top attraction in the sport and an opponent likely in that top 10. Like Leonard and Hearns, they came in with just one defeat between them. Like Tyson and Spinks, it was the lineal champion vs. the people’s champion. There was just one ingredient missing: animosity. Stylistically, their first fight, last September 16 also at T-Mobile Arena, reflected the emotions — or lack thereof — of the moment. The warfare was calm and calculated. It was more boxing match than brawl, with powerful punches absorbed and wills tested but little in the way of recklessness. Golovkin-Alvarez I was not a wild action movie with a 50-car pileup but rather a tense suspense thriller with an artfully shot car chase. And it ended on a brutal cliffhanger. But what genre will the rematch fit? After all that’s transpired in the 364 days between meetings, will the combative personal feelings translate into a more combative fight? Does bad blood mean spilled blood? To understand the enmity between the two fighters and their camps, you must understand what transpired in their first fight, what the official verdict was, and why the rematch was delayed from May 5 to September 15. The first bout pitted a jabbing, come-forward stalker in charming Kazakh Golovkin against a dancing, elusive counterpuncher in Mexican pin-up boy Alvarez. Canelo’s quicker hands gave him the edge early; GGG’s aggression powered him through the middle six rounds of the fight; Alvarez surged down the stretch with cleaner punching. You could easily find eight or nine rounds to give Golovkin if you were scoring with an emphasis on forward movement and offensive activity. You could easily find six or seven rounds to give Canelo if you ignored their feet and scored with an emphasis on power punches. In every single round that Alvarez won, Golovkin had moments. In every single round that Golovkin won, Alvarez had moments. It was clear that while both fighters were wary and respectful of the other’s power, neither was afraid to get hit or lacked confidence that they could take the punch if need be. Over 12 rounds, GGG outthrew Canelo, 703 to 505, and outlanded him, 218 to 169, according to CompuBox. Alvarez landed more body punches, by a margin of 44 to 8, and outlanded Golovkin in power punches in seven of 12 rounds. It was, by any reasonable standard, a close fight. Judges Dave Moretti and Don Trella both thought so, scoring it 115-113 Golovkin and 114-114, respectively. But judge Adalaide Byrd handed in a scorecard befitting the post-truth era, 118-110 Alvarez. And that’s when it started to turn personal. The Cliff’s Notes version looks like this: Golovkin felt Canelo had been given a gift and wasn’t about to give him another one at the negotiating table, driving a hard bargain over the course of contentious rematch talks. On January 29, after months of haggling, the deal was announced for May 5. But in March, Canelo tested positive for the banned substance clenbuterol in two urine tests. He used the popular “tainted beef” excuse but was suspended and the rematch was scrapped. 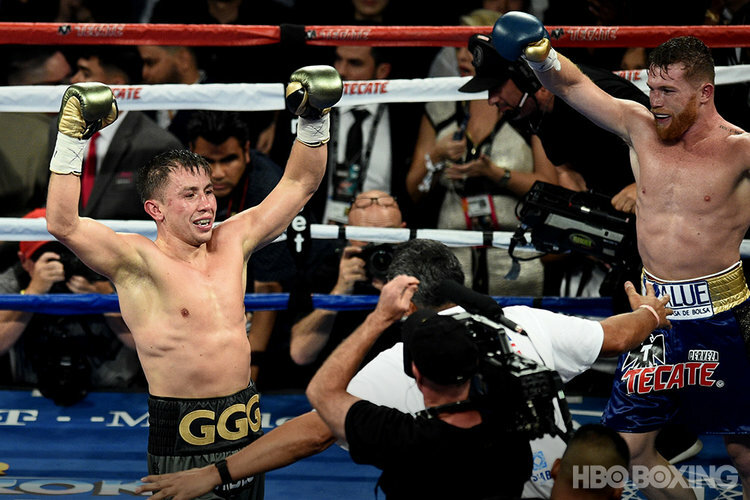 Golovkin and his team were venomous in their anti-Canelo venting. Alvarez had cost Golovkin time and money (at least temporarily). Golovkin dragged Canelo’s name through the spitbucket. But GGG was determined not to waste a training camp, so he took an alternative fight against Vanes Martirosyan, which he won by easy second-round knockout. Then negotiations recommenced, again they were hostile, but again they led to a contract, announced on June 13, with Golovkin’s percentage of the proceeds higher than ever this time. When they were punching each other in September 2017, they were getting along just fine. Ever since, Golovkin and Alvarez have openly hated each other and everything the other man represents. Now they get a chance to act on those feelings. Questions abound entering the rematch. Who does the delay from May to September help? Is it an advantage for Canelo, who’s in his prime at 28 while GGG might be slowing down at 36? Or does it favor Golovkin, who fought in May and will be facing an opponent shaking off a full year of rust? Will Canelo be, ahem, a different fighter in the post-positive-drug-test phase of his career? Can he get in shape to throw more punches and be more consistent from round to round this time? And then there’s the question at the core of everything: Will Canelo fight in the same movement/counterpunching-oriented style as last time? As Sanchez backhandedly complimented him on the HBO Boxing Podcast, “Canelo fought a great fight not to get knocked out.” Abel has been trying to get under Alvarez’s freckled skin throughout the build to the rematch, trying to twist his arm into fighting in a more stereotypically Mexican style. The irony is that in the first fight, Alvarez did some of his best work when he stood still. The second round was one of his best, and he barely used any lateral or backward movement in those three minutes. Sanchez insists he wants Canelo to stand and trade, but as Alvarez has the faster fists, that might actually be the worst thing for GGG. Golovkin might be better served once again chasing Alvarez, especially if he and Sanchez can devise a better plan for cutting off the ring. But rather than promise to engage on Saturday night, Alvarez has instead engaged in the age-old boxing-vs.-running debate. If Alvarez boxes in a careful and composed manner again, the stage is set for another fight that can be seen multiple ways and will be left in the hands of the judges. There will be no Adalaide Byrd this time — the pencils will be held by Nevada’s Moretti and East Coast veterans Glenn Feldman and Steve Weisfeld — but there was nearly a different Byrd sighting. Adalaide’s husband Robert, one of Nevada’s top referees, was approved for the rematch by both fighters’ camps despite his wife’s unfortunate history. But in the end the Nevada State Athletic Commission steered around that potential cloud of controversy and gave the assignment to another longtime East Coast official, Benji Esteves. Clearly, Golovin and Sanchez want it to be Esteves, not the judges, who gives the final word on the outcome of this fight. That sounds more like pride talking than personal enmity talking. But it doesn’t really matter where it’s coming from. If Canelo and GGG both fight as if winning controversially isn’t good enough, then all the aggravation of the last 12 months for fight fans will have been worth it.